Quads Birthed in our Driveway. Be Known for Something : Discover Your Church Communication Thread / Business Essentials / Quads Birthed in our Driveway. Quadruplets. Right in our driveway! Next to our car. It happened so suddenly with little warning. But the Mother practically smacked us when we came too close. 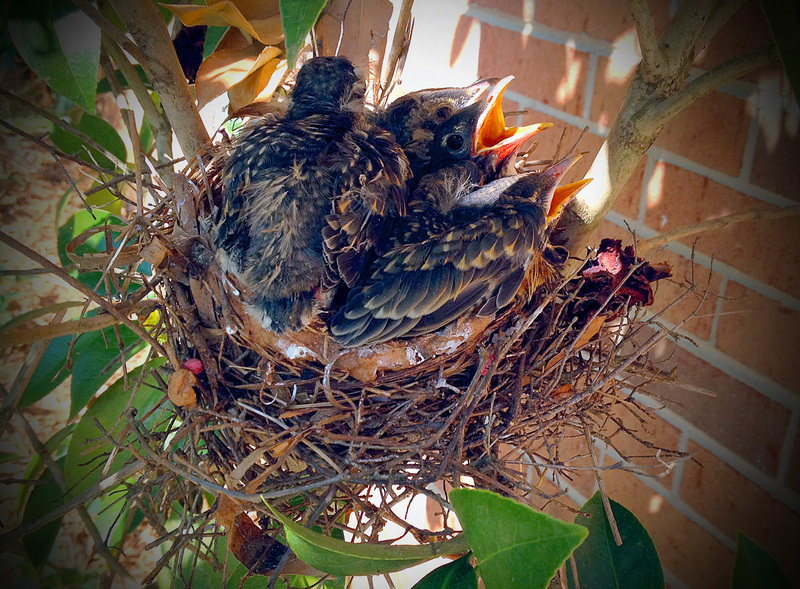 Yes, I’m talking about the 4 little robins that hatched in the shrub just outside our door. We’ve been watching as the robins prepared the nest, then laid the eggs. And now are feeding the winged family. It’s all fascinating. It’s just like a business. Preparation: First came a great idea; then you got together with the right people and started to lay the foundation of your business. It’s important to have a business plan that is “big enough” but not too big. It doesn’t have to be fancy. Just right. Birth: Then the company “opened”. It probably hatched faster than you wanted; or it may have taken an eternity. But it happened. In fact, it’s pretty easy to start a business. But now what?!? Nourishment: This is often the missing part in business. Although it comes naturally for the robins. They continually search for worms and swoop in to feed the very demanding young ones. A business is demanding too — but as the entrepreneur, you NEED to be constantly feeding the sales pipeline, the employees, the clients and business plan. If not; it doesn’t take long for the infant company to perish. Take Flight: Then one day, the well oil-machine starts to work on it’s own. Divisions and managers take over and spread their wings. It’s not easy running a business. And from watching the mother Robin; it’s not easy raising their family. It’s a constant thing. Just like it needs to feel for us as business owners. And every step is critical.